Yamaha has launched official accessories for the FZ-FI Version 3.0 and the FZS-FI Version 3.0. The list of accessories includes a tank pad, decal set for the bodywork, pillion footrest, engine guard, bash plate, seat cover and a USB charger. Prices range from Rs 175 to Rs 800. However, there are no performance-enhancing parts on offer. All the accessories are available at Yamaha’s authorised dealerships across the country. Yamaha has launched the FZ Version 3.0 in the country at a starting price of Rs 95,000 for the FZ-Fi ABS and Rs 97,000 for the FZS-Fi ABS (ex-showroom Delhi). The bike gets a new redesigned front portion with LED headlamp. The tank extensions are more muscular, and are complemented by a sporty-looking engine cowl. At the rear, the body panels look the same as the one in the Version 2.0. The motorcycle is powered by 149cc single-cylinder air-cooled, fuel-injected engine which produces 13.2PS and 12.8Nm, working alongside a 5-speed transmission. Suspension bits include telescopic front forks and a monoshock at the rear. The bike is anchored by front and a rear disc, with single-channel ABS as standard. Primary rivals for the Yamaha FZ Version 3.0 include Bajaj Pulsar NS 160, TVS Apache RTR 160 4V, Suzuki Gixxer and Honda CB Hornet 160R range. Yamaha FZ-Fi Version 3.0 prices start at Rs. 95,680 (Ex-Showroom). Yamaha FZ-Fi Version 3.0 is available in 1 variants and 2 colours. Share your experiences with FZ-Fi Version 3.0? The claimed ARAI mileage for the Yamaha FZ-Fi Version 3.0 petrol is 45 kmpl. Q. TVS Apache RTR 160, Yamaha FZ Fi V3, Honda Hornet and Bajaj Pulsar 150 in four bikes, which one is good? Q. Which one is better in terms of mileage, ground clearance and maintenance cost of Apache RTR 160 4V and Yamaha FZ Fi version 3.0? Q. Which one is better in looks between Honda Hornet and FZ-Fi V3 ? Honda Hornet..... I'll say because you get both stylish, sporty look with top performance and mileage rather than FZ. Q. How much is the diameter of disc brake? Q. Pulsar 150 aur FZ S version 3.0 kaun si jyada achhii hogi? Q. What about the performance in off road and hilly region of FZ S V3? 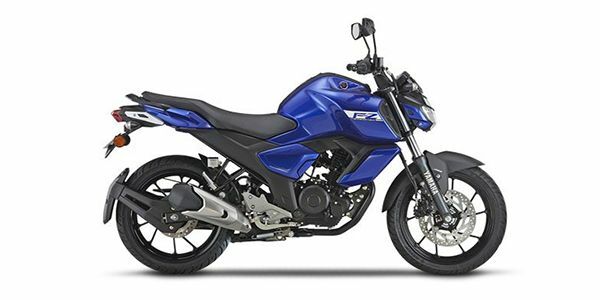 Confused about Yamaha FZ-Fi Version 3.0?